I am a huge cupcake fan. Something about their miniature size just makes me want to eat them all. 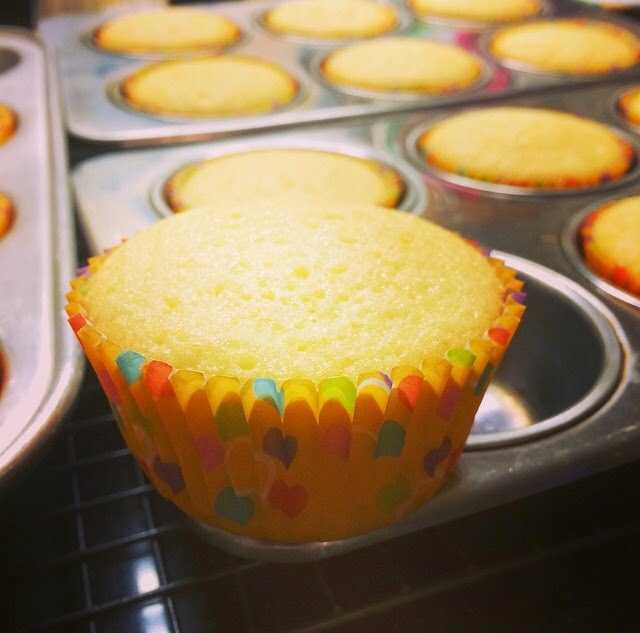 About a couple of years ago, I tried making some cupcakes from scratch, but the result was not the moist cupcakes I could get from a Duncan Hines box mix. Recently, I decided to give it another go. I made some Martha Stewart Snickerdoodle cupcakes that were actually pretty good and for a cupcake swap I was attending, I chose to use this lemon velvet cake recipe. 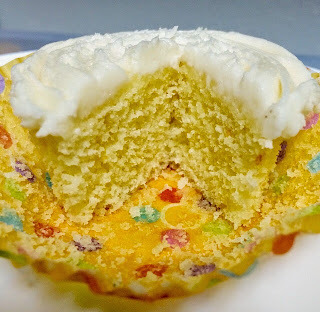 I ended up with some delicious cupcakes, but they were not as moist as I had hoped for. It could be that I didn't use superfine sugar nor did I have the energy to run regular granulated sugar through a blender. Or maybe I didn't mix well enough since I used a hand mixer and not my stand mixer. In all cases, I'm pretty sure it was user error so I hope you get better results! First, sift together 2 1/4 cups cake flour, 2 1/2 tsp baking powder, and 1/2 tsp salt. Set aside the flour mixture. Next, cut 1/2 cup unsalted butter in 1 inch pieces and place in bowl of stand mixer. Add 1 tsp lemon zest and 1/2 tsp navel orange zest. Mix on low speed. Increase to medium speed until mixture is smooth and light in color. This may take up to two minutes. Add 1 1/3 cups superfine sugar, one tablespoon at a time. Next, add 3 eggs, one at a time, spacing them 1 minute apart. Lower the speed to low. In a separate bowl, combine 1/3 cup water, 3 T fresh lemon juice, and 1/4 c fresh orange juice. Starting with the flour mixture, add a third to the stand mixer and mix. Then add about half of the juice and mix. Repeat once more and end with mixing the last third of the flour mixture. Bake in a greased 13x9 pan at 350 degrees for 30-35 minutes. About 18-20 minutes for cupcakes. When done, the cake should be golden brown and springy to touch. The recipe suggests topping with powdered sugar, but I made a vanilla butter cream frosting. A cream cheese frosting would also be delicious. Recipe Credit: Great Cakes by Carole Walter.